This skip is ideal for large building projects or renovations on your house and is perfect for large bulky items. This skip is mainly used for wood, steel, garden waste and bulky items. The Industrial 14 yard skip can hold between 100 and 120 full black bags. This skip is designed for bulky materials only. This includes timber, metal, light rubbish, and bulky waste. It is not suitable for soil, rubble, stone, or concrete. This is the first of our commercial skips but it can also be used for large residential building projects or renovations. It is perfect for all those bulky waste items that you need to get rid of. For large house clearances and bulky items such as furniture, we highly recommend this large domestic skip. It is 14 cubic yards in volume which makes it capable of holding quite a lot. 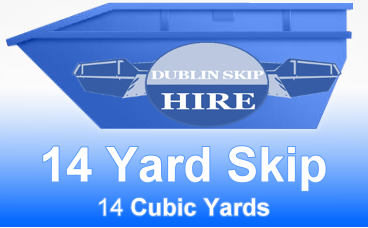 If the industrial 14 yard skip sounds like the size required for your building project or commercial job you can contact us today. We’re always at hand to help and ask any hire questions you might have. We can arrange the delivery and collection to suit your needs and all the waste is handled carefully and we recycle as much as we can.